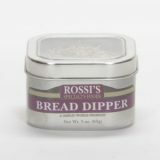 We have another great addition to our Rossi’s Specialty Foods line here at Garlic World. With a sweet taste of brown sugar and citric peels matched by a kiss of paprika and California’s own world famous garlic to bring it together, this spice is sure to make your senses go wild when its time to cook. This great range of flavors goes great with Beef, Chicken, Pork, Vegetables, Soups and Marinades. Brown Sugar, Salt, Spices, Garlic, Onion, Orange Peels, Paprika.